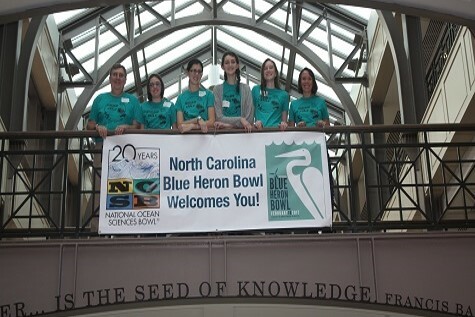 Students and coaches from coastal communities and landlocked states recently rallied together at the Regional Blue Heron Bowl in Wilmington, NC around the theme of marine renewable energy: Blue Energy – Powering the Planet with our Ocean. What makes this team unique? The Dobyns-Bennett team is made up of four young ladies- Elizabeth Batts, Lilly Kramer and Allison and Jamie Cahill. These ladies set a great example of the importance of equipping girls in STEAM and encouraging pursuit of these careers to develop a diverse workforce. Competing against North Carolina’s top performing high schools in math and science, Dobyns-Bennett finished in the top 5 at the Regional Competition. In addition, the coaches and volunteers at the event awarded the team with the “Sportsmanship Award” for their positive enthusiasm throughout the event. Team captain, Elizabeth Batts, shared “working together and applying the strengths of each team member allowed us to have fun while competing. The experience was amazing and the exposure to The University of North Carolina Wilmington’s Marine Science Center is definitely something we will remember.” The team agrees that they are all looking forward to competing again next year. Dobyns-Bennett’s interest in ocean science goes beyond the National Ocean Sciences Bowl. In January, the school launched its inaugural capstone course with a focus on ocean processes. Through a partnership with Eastman and Woods Hole Oceanographic Institution, students are challenged to apply cross-disciplinary learnings to real world issues and problems. By interacting with some of the world’s top ocean scientists on active research projects, students are exposed to unique experiences that will give them a competitive advantage while continuing their education and entering the workforce. Exposure to a capstone course in ocean processes is a unique experience for students and Dobyns-Bennett is one of only a few select high school in the United States offering such a program. Expanding curriculum in the areas of STEAM and increasing a problem-based approach to learning compliments the school’s ongoing plans to introduce a new science and technology center, also known as DB 2.0. Eastman is a global advanced materials and specialty additives company that produces a broad range of products found in items people use every day. With a portfolio of specialty businesses, Eastman works with customers to deliver innovative products and solutions while maintaining a commitment to safety and sustainability. Its market-driven approaches take advantage of world-class technology platforms and leading positions in attractive end-markets such as transportation, building and construction and consumables. Eastman focuses on creating consistent, superior value for all stakeholders. As a globally diverse company, Eastman serves customers in more than 100 countries and had 2016 revenues of approximately $9.0 billion. The company is headquartered in Kingsport, Tennessee, USA and employs approximately 14,000 people around the world. For more information, visit www.eastman.com. Visit http://responsibility.eastman.com/ to learn more about Eastman’s Corporate Responsibility efforts. The NOSB encompasses numerous scientific disciplines and encourages an increased understanding of the science needed to sustain strong communities, including improving community awareness; addressing erosion and increasing coastal populations and development; restoring coastlines; protecting estuarine ecosystems and services; and improving coastal disaster projection, preparedness, and response. The competition tests students’ knowledge of ocean-related topics, which include cross-disciplines of biology, chemistry, policy, physics, and geology. The NOSB is an interdisciplinary ocean science education program of the Consortium for Ocean Leadership based in Washington, D.C.
Woods Hole Oceanographic Institution (WHOI) is the world's leading, independent non-profit organization dedicated to ocean research, exploration, and education. Scientists and engineers push the boundaries of knowledge about the ocean to reveal its impacts on our planet and our lives. WHOI’s hard-won experience at sea, innovative technology, and commitment to research and education make the institution a reliable source of valuable knowledge about the ocean for scientists, decision-makers, and the public.